Rebates are discounts given to the customer for activating a specific phone with a specific Service Plan. The Rebate Incentive is given to the customer at the time of the sale. Defined within the Rebate Incentive is the specific rebate amount received from the Service Provider and the new price of the phone. Once the Rebate Incentive is created, it can be set valid for specific products and applied to specific plans. To access Rebate Incentives from the menu bar of the main TeleTracker Online screen, click Master Files, then Service Provider. Select the appropriate Service Provider and click Open. Click Incentives on the left side column menu. Click . To create a new Rebate Incentive, click the Add button. To edit/open an existing Rebate Incentive, select the appropriate Rebate and click Edit. Description : Provide the appropriate description for this Rebate. Description recommendation. 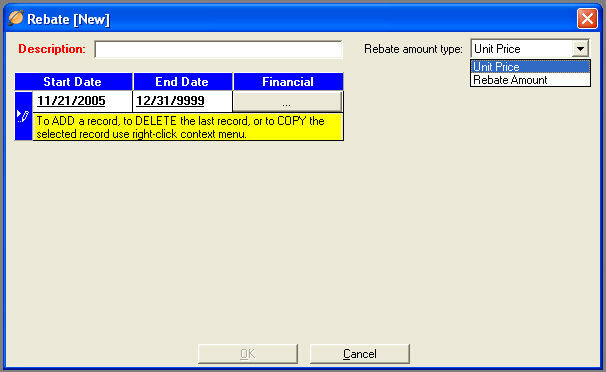 Start/End Dates : Assign the appropriate Start/End dates for which this Rebate is valid. If the Rebate amounts change, input the correct End Date for the last date entry. Create a new valid date range by right-clicking the context menu. Select <Add>. Each date range will have it's own Financial button containing a Rebate Amount. Rebate Amount Type : Select 'Unit Price' to specify the new retail price of the phone after the rebate. Select 'Rebate Amount' to specify the actual rebate amount applied to the Invoice. The Rebate Amount or Retail Price will be defined within the Financial Button as noted below. The Financial Button contains the Rebate Amount. Clicking the Financial Button will begin the process of defining the Rebate amounts for specific products and plans. Click the link located on the left side of the window that says Valid Products. Highlight the Products for which this Rebate is valid. Use the arrows (>) to move the selected Products from the Available column to the Selected column. You may remove Products from this Rebate Incentive by highlighting the Product in the Selected column. Use the arrows (<) to move them back into the Available column. Click the link located on the left side of the window that says Valid Plans. A list of all of your Service Plans will been shown in the Available Column. Highlight the Service Plans for which this Base Incentive is valid. Use the arrows (>) to move the selected Plans to the Selected column. You may remove Service Plans from this Rebate Incentive by highlighting the Plans in the Selected column. Use the arrows (<) to move them back into the Available column. Click the link located on the left side of the window that says Financials. A list of all of your Activation Types will show in the window. From Provider : For each activation type, enter the appropriate receivable rebate amount from the Service Provider. Unit Price -or- Rebate Amount : The Unit Price field contains the new price of the phone sold to the customer. The Rebate Amount field contain the actual amount of the Rebate given to the customer. 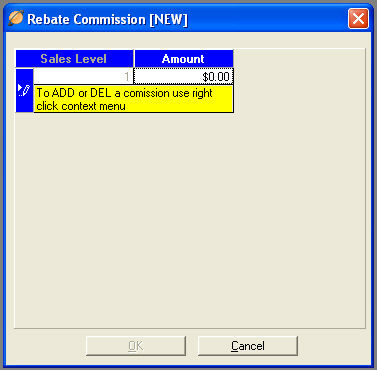 Click this button to define Sales Associate Rebate commission amounts. Amount : For each appropriate sales level, enter the Rebate commission amount paid to the Sales Associate.